Have you seen the new Toyota Corollas? The latest compact sedan has been turning heads from the Japanese automaker. The Corolla has always been a fuel-efficient dream for those who wanted something sleek but affordable with all of the technological gear inside. However, the exterior of the Corolla proves that Toyota is also thinking about the shape and aerodynamic features of the body. The headlamps and fog lamps are all new in this latest version, and the grill design is super sporty, giving the Corolla head-turning appeal on the road. Ranked highly for reliability and safety, drivers get a first-hand look at their blind spots and rear views thanks to a bundle of technology on the outside of the vehicle, including sensors and cameras. No wonder it's one of the top-rated compact sedans on the road today. 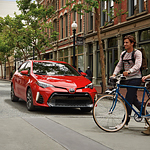 Want to take a spin in the all-new 2019 Corolla? Stop by Lithia Toyota of Springfield for more information.